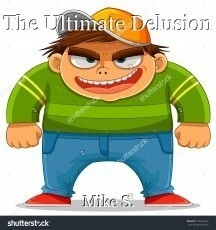 The Ultimate Delusion, short story by Mike S.
If there was ever any doubt in your mind, which I already find hard to believe, yesterday should have proved once and for all, Donald Trump is exactly what he's tried so hard to deny, a scum bag, caveman-era bottom dweller, who has no business existing in 2016, let alone vying to be the next leader of the free world. I know how much some people are willing to overlook, in their desire to win, but this latest comment, when he supposedly didn't know he was being recorded, reveals him to be below crude, and should deeply offend every woman, and, if you ask me, anyone. My God, do you really want your children looking up to this knuckle-dragger, who sounds like someone straight out of centuries past, who evolution apparently skipped? I mean, this is a man who time and time again has been given a free pass for his chauvinistic, childish, macho behavior, and has already done an incalculable amount of damage to our nation's credibility on the world stage. How much is too much pathetic, ignorant, behavior that is frankly, more befitting of a 5th grade bully than a potential president of these United States of America? It was all over our news too, Mike. I couldn't agree with you more. If the unthinkable happens I can see things taking a big step backwards. And you summed it up so well! Thanks, Hully--and I agree with your assessment! This page was created in 0.3281 seconds.